Discovering Pipedream was one of those rare occasions when my instincts were spot on... I saw this strange disc in a local Columbus shop, with hardly a word written on the cover, just the band's name and the title. Even the liner notes were minimal and gave me the idea they might be a techno/dance outfit. But I just had a feeling...and after seeing it several times over a period of a few weeks, I went for it. Maybe it was the mention of Hamburg in the title, where Cluster recorded one of my favorite electronic works 'Sowiesoso.' Or maybe it was just the mystery of it all.... what exactly *was* this album all about?! As I soon learned, Pipedream is a very adventurous trio of space rockers (I guess you could say) from Vancouver in British Columbia, current home to Hawkwind's old knob-twiddler and axe handler Del Dettmar. Perfect! This album, entitled 'The Journey from Hamburg to Iceland Begins' (1996, Futura001CD), itself is full of wonderful spacey sounds and effects, but there's much more to it than that. Percussionist Dr. Roberts is a chief member of the group, his hypnotic beats (coupled with Jupiter Six's 'tremolo bass') laying the solid foundation upon which the layers of electronics fly (duties shared between Jupiter Six and D.T.). The results are outstanding...the four lengthy explorations that the three undertake last almost an hour and every moment sounds fresh and exciting. What an unknown gem this is! "Venus Fly-Trap" and "Public Address System" (the first part of Track Two) are similar in some respects, both long, pulsating jams bolstered by Dr. Roberts tom-heavy, but not quite Dingerlike, drumming style. The transition from "PAS" into "Pompeii" is a climactic point in the album, the trio turning things up a bit to present a wondrous and majestic statement as if we've just emerged from behind a planetary shadow to gaze upon a star's birth. Next, the six-minute "Passing Trains" is Green-era Hillage re-done (sans guitar), but I honestly think this tune is superior to anything on that album... and these keyboard sounds are among the best I've heard in the 90s. The finale, "Saturday Disaster" is presented in four parts lasting over twenty minutes, and is actually the most adventurous work. Part One is very minor and unsettling (not unlike my beloved Circle from Finland) with (from what I can gather) D.T. switching over to slide guitar and using lots of echo effects. Part Two is more of a freak-out, the rhythm track appearing more subtle beneath the outbursts of crazed feedback guitar. The quiet, spacey stillness of Part Three lulls us into thinking the album is set to drift off into nothingness when to top it all off, the three treat us to a more spirited reprise of the beginning. Everything presented here was recorded live in the studio, and it's difficult for me to see how just three musicnauts could flawlessly produce so much music of such a poignant nature. Over the past six months or so, 'Journey' has probably seen more rotations in the ole' CD player than anything else, but I'm afraid I have to admit to knowing nothing about who these folks are. But after a fruitful internet search, I did manage to track down a website for the band. To my dismay, very little biographical information was to be found there, though an e-mail link to Dr. Roberts himself proved to be key, as it gave me the means to drag out some info from these guys who seem so elusive. So, here we go, it's time to unveil the mystery behind these enigmatic characters and astral navigators of distant worlds. AI: How did Pipedream first get started...had you all played in other bands in the Vancouver area before getting together? Dr. Roberts: Pipedream is the result of suburban boredom, records, and time on our hands. None of us had much experience with instruments, let alone playing in a band. Well, that isn't entirely true. DT had played trumpet in our high school jazz band class, but truth be known was kicked-out or failed, I don't remember which. In late summer 1992, Jupiter Six borrowed and eventually acquired, DT's neighbour's bass guitar and amp. DT fetched his dad's acoustic guitar from the back of a closet. I gathered an assortment of percussive junk (paint tins, a plastic garbage can, metal and plastic objects, and a rat-cage), arranged them on the frame of a broken couch, and for several months we marvelled at our ability to create and maintain the semblence of a tune and rhythm. Since then Pipedream has really just been a continuation of the basic theme of sustained breaks and motifs that characterized even the worst of our formative efforts. AI: Pipedream has a really interesting sound... without the crunching rhythm guitar, I would be hesitant to christen it Space Rock (á la Hawkwind), but at the same time your music has far more substance than simple ambient fluff or pure electronic noodling. 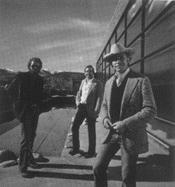 How was it that the three of you developed the Pipedream sound and what influences did you each bring to the table? DR: When we started, the only means we had of articulating any ideas about the type of sound or arrangement we were each interested in was to refer to the music we were listening to, and most influenced by, at the time. The main common influence was Pink Floyd. Protracting and playing out themes reminiscent of psychedelic breaks with repetitive themes and motifs became a loose method of jamming and arranging parts that we could lock into and call songs. Most often tracks would begin with a single guitar, bass, or keyboard riff, or sometimes just a sound or tone, and we'd jam around that — a fairly common approach. Here I'm not talking about the period of ramshackle exploration we did with borrowed gear and junk. There was little we were capable of doing at that time to realize the sounds that we hoped for. Between then and the winter recording session for 'The Journey...' CD in '95 we sought out the type of equipment used to generate some of the sounds we liked. The broader possibilities, and interesting anomalies, of the old synths I guess really moved us towards the sound that we have now. DR: Well, I suppose I could go on about its evocation of spatial momentum, a sustained experience of brief details, or some vague Krautrock reference, but really the story isn't that crafty. We lifted it from a Rick Wakeman record sleeve. He released a record on which he interpreted Jules Vernes' book 'A Journey to the Center of the Earth.' In the accompanying photo booklet/gatefold, one of the pages had "The Journey from Hamburg to Iceland Begins" written on it. We liked it and its panoramic uncertainty, so we used it. AI: You recorded 'Journey' live in the studio - so I wonder how much of the songs were fully composed vs. done through total improvisation? DR: To a point I would say that none of our songs are ever fully composed. The basic tracks for the CD were recorded in the same way we would play them in live settings. For each we had parts and their order figured out, but how and when we made the changes was left pretty open. Each of us were responsible for deciding when we wanted certain things to happen and would try to cue the others. As always we exploited happy accidents and jammed out the tracks, ending up with something a little different than the last time we played them. The body of the songs were recorded live off the floor over one night's session, but several additional tracks were recorded over subsequent nights. The live-in-the-room way we recorded the CD contributed a lot to the sound that you asked me to explain. Everything was simply miked in one large, high-ceilinged room, with some PZMs (Pressure Zone Microphones) on the ceiling, and away we went. Consequently, we had to cope with considerable bleeding between tracks but tried to minimize the now-characteristic murky sound that you can still hear. AI: Your percussion work is very integral to the pulsating and tribal nature of the music, sometimes termed 'motorik' in reference to the old 70s Düsseldorf artists Neu!, Kraftwerk and the like. What sort of equipment or techniques do you use to produce these sounds? Lots of various toms it seems. DR: Yeah, that's it really. I play a five-piece stainless steel Ludwig kit, 1973 I think, and for much of the album used mallets on the toms. My "technique" is, I suppose, the result of my early junk-percussion period. For the first few years, none of us were too familiar with bands like Neu!, Can, etc., so I can't say I was nodding in their direction. Some of Nick Mason's techniques on "Set the Controls for the Heart of the Sun" and "Saucerful of Secrets" were of more influence. But still, not having much experience drumming with my feet, I have followed the sustained momentum of the oscillators, tremolos, and droning chords with the sort of soft-attack, cyclical drum riffs heard on the CD. For some time I was wary of the snare and hi-hats, and tried not to disrupt the warmth or flow of sounds, but I've come around and in later recordings used them considerably more than the toms. DR: I'm not sure where you locate the beginning of "modern," at the digital divide I suppose, but yeah, we do rely quite a bit on some unreliable old synths. The appeal, like I mentioned, was the pursuit of the familiar. We wanted the sounds that were behind Pink Floyd, and early Tangerine Dream. In the process of trying to collect these sounds, Jupiter Six, in particular, has taken a conceptual interest in their familiarity; in the relationship between the familiarity of the sounds and the equipment as objects. Of late he has been further exploring the peculiarities of the collision between the otherworldly impressions of the sounds, as he remembers them when young, between the memory of the sounds as having value in and of themselves, without association to their origins, and the experience of their objectification as equipment. AI: What's happened with you 2nd full-length album? I've been expecting it to appear for quite some time now. DR: The Amberley release is a mystery. That record should have been out over a year ago, but an endless series of evasive explanations seem to suggest that the label is less than coordinated. I've been hearing some poor reviews of their behaviour from one of our mailorder distributers so we'll have to wait and see what comes of this. "Deeper Arcades," one of the tracks from this release, will be coming out on a compilation of Vancouver bands sometime in this new year. The Good Jacket was a clothing store here that held gig/parties from time-to-time to raise money for a local charity, Loving Spoonful, that provided healthy meals for those dying of AIDS. The store was recently sold, but as a last fundraiser and tribute to the memory of those parties, a CD compilation of the bands that played them is being released. At the moment I'm not clear about the details (title, label, etc.) other than the fact that it will be some new exposure for a now old song. AI: How has your recent material differed from the music on the debut? DR: I think that our relatively recent material still bears the Pipedream mark fairly clearly, but there has been a move away from the pulsing rhythms. I played keyboards on much of the newer material and kept the percussion even more minimal than on earlier releases. Partly this was because we recorded the last several tracks in a friend's apartment and spent more time with equipment we could more easily manage the volume with. AI: I've heard that Vancouver is a rather 'liberal' city in terms of enforcement of drug laws and such. Has that fact created a natural audience for psychedelic music? DR: Drug laws are enforced here. Cafes are around that allow people to smoke pot on the premises, and that sell paraphenalia, but there is still some level of enforcement — I don't know what sort of loophole these places manage to wriggle through. Nonetheless, I wouldn't say that the relative laxness of our city is really a benefit to the presence of a music scene though. People do it. People don't do it. It doesn't characterize, or provide, a natural psychedelic audience. It is there, but not key. AI: And on that note, are there any other bands in the space/psych/electronic vein in Vancouver, and do you team up for shows and such? AI: What if any future plans for gigs outside the Pacific Northwest do you have? DR: None. With the type and amount of gear that we haul to and from gigs, even local ones are a hassle and tour plans are unfortunately not a part of my university schedule. AI: Any other projects you currently have going outside of your work in Pipedream? DR: Jupiter Six and I are each involved with our own new-age-angst projects. Jupiter Six plays live, and recently began recording, under the name 'Sinoia Caves.' I have been recording under the name 'Of A Street,' though with nothing as yet projected for release. AI: Where can people locate your debut CD ('Journey') and the 7" EP. Are those items still in print? DR: Our 7" ("Setting The Snare" b/w "A Narrow Light In The Dark," released 1998) and CD can be ordered from me by post or email, or some mailorder and retail outlets. Earworm Records can also be contacted for the 7"s. There is still a small quantity of CDs in my possession, the rest are out there in the new age. Contact info: Pipedream, 10140 Aintree Cr., Richmond, BC Canada V7A 3T8 (Prices for the 'Journey' CD are CN$15/US$11 ppd, and CN$8/US$6 ppd for each 7"; remember, letter postage to Canada from US is 48c for .5 oz./55c for 1 oz.) You can email Pipedream at astreet@direct.ca, or visit their web site at http://persweb.direct.ca/astreet/.